Personal contract hire (PCH) is growing at an incredible rate as more and more consumers are turning their back on hire purchase (HP) and choosing to lease their cars instead. 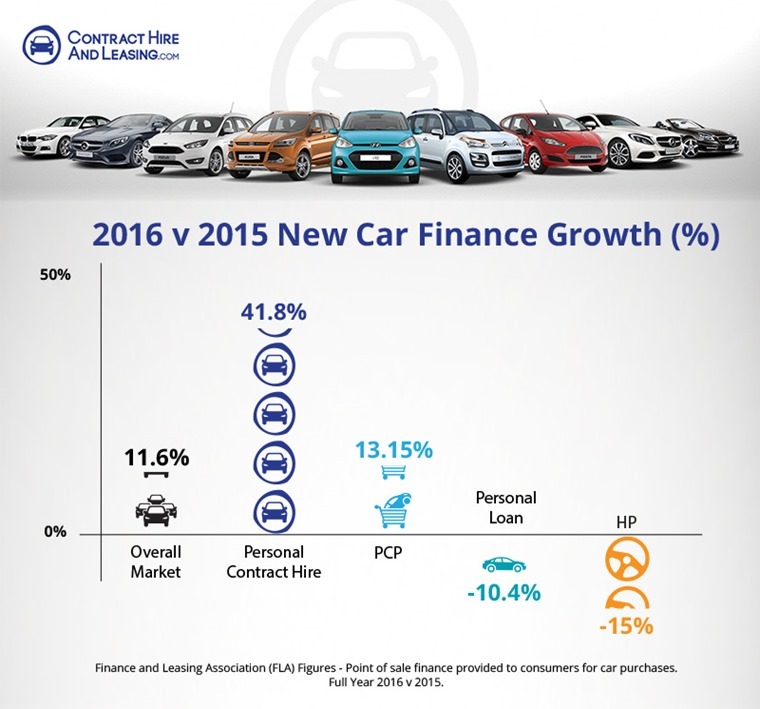 PCH, commonly known as leasing, now accounts for 8% of the new car finance market, according to the latest figures from the Finance & Leasing Association (FLA), obtained by ContractHireAndLeasing.com. Personal Contract Purchase (PCP) is still the most popular form of car finance, and continues to grow, but HP’s popularity is waning considerably, falling 15% in value in 2016. Four out of five people on PCPs don’t opt to buy the car at the end of their contract. Monthly HP payments are traditionally much higher as the consumer is working towards ownership and paying off the entire car in equal instalments. PCP involves a balloon payment after a number of years to take ownership of the vehicle, but, according to the FLA, four out of five people don’t make this balloon payment to buy the car at the end of their PCP contract. All this would suggest that the UK is beginning to fall out of love with car ownership, in favour of usership. Leasing could overtake HP as the second most popular car finance method for consumers by the end of this year. In the US, 34% of people now lease their vehicles. In states such as New York and Michigan, this figure is above 50%, according to Frost & Sullivan. So the UK still has a long way to go to catch up to the US. The point of sale (POS) consumer car finance market as a whole grew 12% by value and 8% by volume in 2016. The percentage of private new car sales financed by FLA members through the POS reached 86.6% in 2016, up from 81.4% in 2015. What all this means is that almost nine out of ten private new cars sales are secured using some form of finance product. Whichever finance method is used to secure a new car, consumers need to ensure that they do their research, and choose the method that is right for them.